Please excuse the messy bed, I had just finished putting everything together. Also, I think I need to put more buttons on there, 4 is def not enough! The color is off in both pictures, at least that's how it is showing up on my screen- I think they are much closer in color then they actually appear. 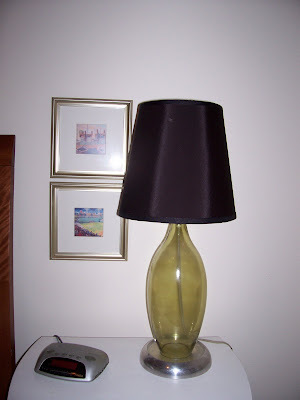 I also found lamps and covered the shades in black silk. Once i got them up I realized that I think they are a little small; but, on the left hand side of the bed there is not room for an actual end table because the heater is there, so I made a wooden top for it and that is used as the end table. But, hey they work for now and they were FREE! Someone in my building was moving out and getting rid of them...score for me! I stopped into Calico Corners this weekend and ordered a few samples of kelly green fabric- so when they come in I'll pick something that will be like the KWID Trellis. Still more things to finish, but its getting there! oh it's coming along so so great! 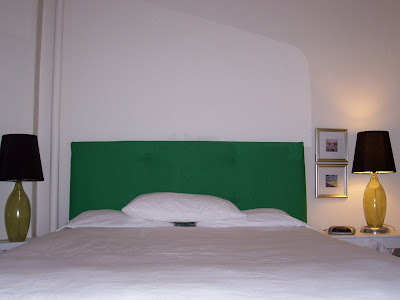 and the black lamp shades turned out so well - as did your headboard (i agree with you that it needs more buttton tufting though!). amazing job! The color is just gorgeous! You did a great job. Thank you everyone! 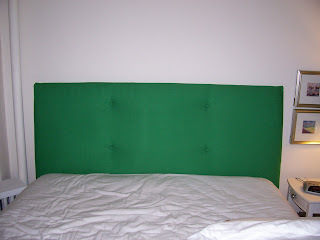 I have more pics to put up this afternoon, I made a pillow with green ribbon to match. I still need to work on getting the blue in there, but its coming along. 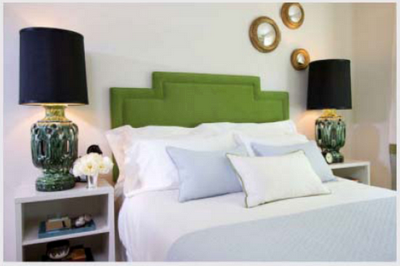 nice - find some mirrors to hang up above the nice new headboard!